Stepanakert, September 02, 2015 — On September 1, during an award ceremony held at the presidential palace in Stepanakert to mark the 24th anniversary of the proclamation of the Nagorno Karabakh Republic, President Bako Sahakyan conferred awards on a number of outstanding individuals. The honorees included Hayastan All-Armenian Fund Executive Director Ara Vardanyan, who received the Vachagan Barepasht Medal for his contributions to the development and prosperity of Nagorno Karabakh. Throughout the 23 years of its existence, the Hayastan All-Armenian Fund has had an instrumental role in the socioeconomic progress of Nagorno Karabakh, by implementing far-reaching infrastructure and community-development projects including the construction or refurbishment of roads, water and gas pipelines and networks, schools and kindergartens, hospitals and health clinics, multifunctional community centers, and various cultural institutions. 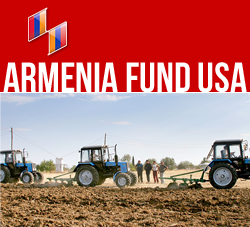 Currently the Hayastan All-Armenian Fund is building the Vardenis-Martakert Highway, a project of significant economic and strategic importance to both Armenia and Nagorno Karabakh.